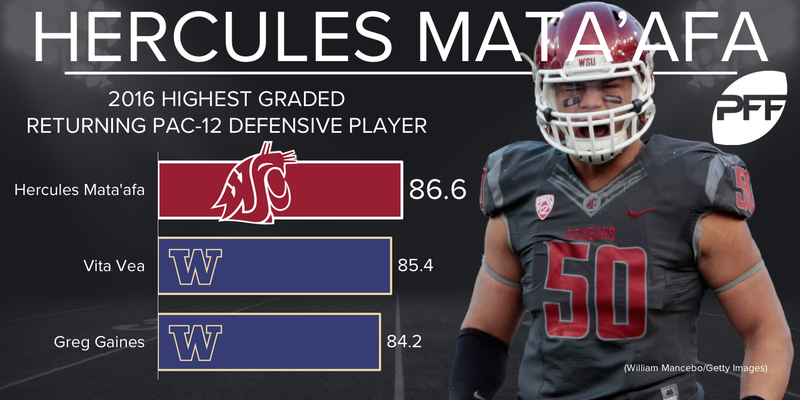 Washington State interior defender Hercules Mata’afa was a dominant pass-rusher from the interior of the defensive line a season ago, while he projects to be more of an edge defender at the next level. Mata’afa finished No. 1 in terms of inside pressures applied per snap, applying a pressure on every 15.7 snaps on the inside of the defensive line. Mata’afa was also solid rushing the passer from the outside. His pass-rush productivity grade of 13.9 from the left and 6.0 from the right side of the defensive line ranked him No. 4 and No. 8, respectively. His overall pass-rush productivity grade was a 11.8, No. 4 among draft-eligible DIs. Mata’afa racked up 90 or more snaps from six different positions across the defensive front last season. He was also quick off the ball as Mata’afa ranked No. 6 in pass-rush productivity in 2.5 seconds or less. The redshirt-junior was no stranger to stopping the run either, finishing No. 14 among draft-eligible interior defenders with his 9.5 percent run-stop percentage. Mata’afa will need to tighten up his tackling efficiency as he missed 12 tackles a season ago.